Dental crowns are also known as caps because they are placed on top of the tooth and cover it. Their purpose is to protect teeth that have been broken or damaged and restore their appearance to normal-looking teeth. 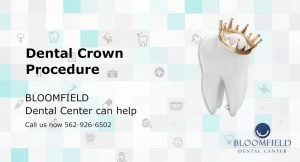 Permanent crowns are custom-made of various metals, porcelain, or a combination of both depending on the situation and preference. They are made to look the most natural as well as the most durable to withstand against the normal wear from eating. Typically, they take several weeks to make. For the procedure, the dentist will first examine the tooth that will receive the crown. If the tooth is severely decayed or infected a separate procedure, such as a root canal, will have to be performed first. Once the tooth is ready for the crown, the top and sides of the tooth will be filed down to make it smaller. Then, the dentist will have to determine the shape of the filed down tooth in order to make a crown that will fit perfectly over the tooth. The dentist will do this by making a mold over the tooth using putty or paste over the tooth that will harden and have the tooth’s impression in it. A digital scan of the tooth is another way that the dentist can use to capture the shape. Afterwards, the dentist will use the impression to make the crown according the configuration and shape of your teeth. It is made in a laboratory and can take several weeks to produce. While the crown is being made, a temporary crown will be placed on the tooth.